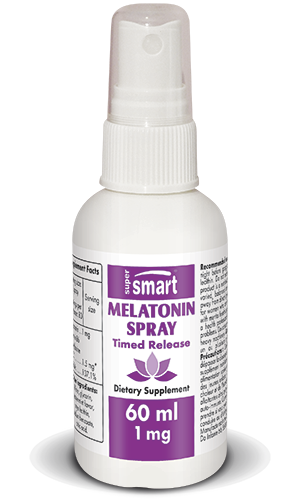 Melatonin Supplement Spray 1 mg | Timed Release Benefits | Get Here! Helps those whose sleep patterns are out of synch, and reduces the time it takes to fall asleep. Faster, more thorough sublingual absorption. Melatonin Spray complements the existing range of melatonin tablets and capsules. The sublingual spray allows for faster, more complete absorption than can be achieved with oral supplementation, as the active principles go straight to the bloodstream without being digested. It is a route of administration with optimal efficacy. This prolonged-release formulation is particularly good for those who tend to wake in the night or early hours as its effects last for several hours. Each spray provides 1mg of melatonin combined with 1.5mg of vitamin B6 and is completely adaptable, depending in particular on how you feel when you wake up: if you find waking up in the morning difficult, the dose may be a little too high. If, on the other hand, you feel you have had insufficient sleep, the dose can be increased. Other ingredients : water, glycerine, peppermint flavouring, soya lecithins, sodium benzoate, citric acid. adults.Take one or several sprays under the tongue, as required, in the evening before going to bed. Contains soya lecithins. Not recommended for women who are pregnant or breast-feeding, or for individuals with mental health problems or auto-immune diseases. Consult a health professional before taking this product if you have a health problem. Do not take melatonin before driving or using machinery.